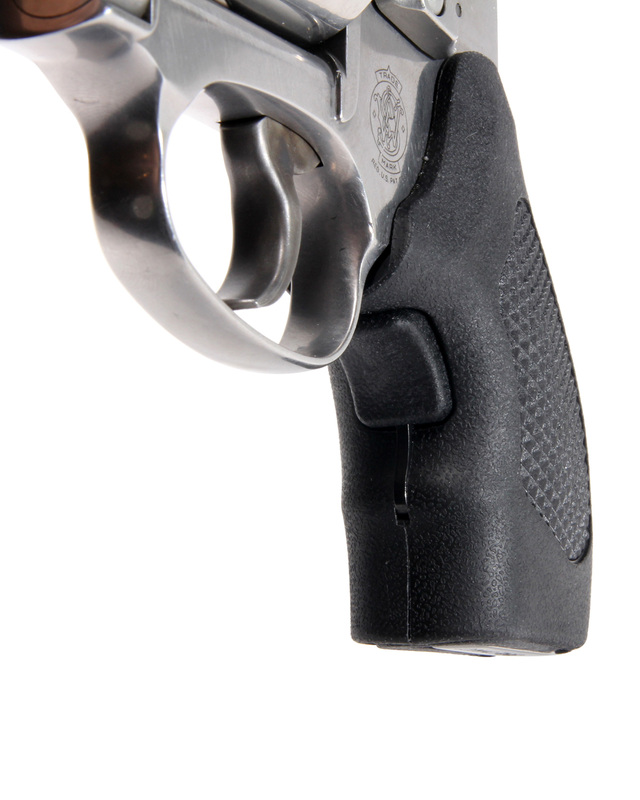 Snubnose revolvers are a favorite of armed professionals and have been for many years. The balance of lightweight power and maneuverability are excellent. About the only thing about these revolvers we may change are the grips. Snubnose revolvers are a favorite of armed professionals and have been for many years. About the only thing about these revolvers we may change are the grips. There are various models with 2-, 2.25- and 3-inch barrels. The J frame five-shot revolver is a great hideout and a reasonable choice for front line carry. The snub nose .38 Special revolver requires dedication and practice with the proper technique. If you deploy one of the J frame Magnums, then you really must practice. Some of the revolvers are supplied with good, hand-filling grips, but they are large for pocket carry or easy concealment. The J frame revolver with its five shots for certain is a good close range defensive handgun. The grips have been called minimal or even diminutive—and they are. However, if you put hand-filling oversize grips on the piece, you might as well carry a larger handgun. The J frame is meant for a rapid draw and deployment. Many of the grips are so small that you have the small finger hanging off of the end of the grips. Yet, if you add a larger set of grips, you end up with a measurement that is just enough larger that the handgun, so it becomes very difficult to conceal. The grip itself is small and easily concealed. 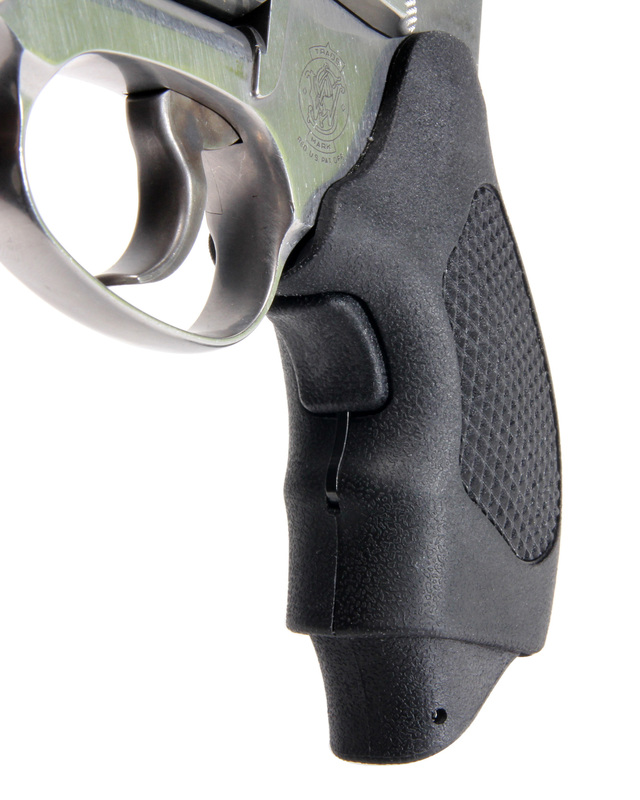 There is an extension of the grip that is activated by a spring-loaded lever. With these larger grips, the J frame revolver is actually much easier to fire and use. The accuracy potential is greater than many would think. Many attempts have been made at designing a grip that offers a good gripping surface but remains compact. The Pachmayr Guardian grip is among the most interesting yet and certainly the most innovative. The design is simple enough. This spring-loaded extension rocks into place and allows firing the pistol with much more comfort. A rough analogy is the difference between the flush fit and extended grip offered with compact self-loading handguns. The longer finger extension is more comfortable to fire while the flush fit magazine is more difficult to control. The same applies to the firing grip of the J frame revolver, but the grip is more permanent—until now. You mount the new Guardian grip on the J frame revolver, and then the revolver easily stashes in the pocket. Draw the handgun and, as you take the firing grip, the lever on the face of the front strap activates the small finger rest and it comes into play. This is a neat, reliable system that works well in practice. Draw the handgun and, as you take the firing grip, the lever on the face of the front strap activates the small finger rest and it comes into play. When the grip is mounted, you must remove the alignment pin from the grip frame that usually butts into the grips. The tension of the grips and attachment points are good enough. As for firing the piece, the difference is considerable. There isn’t a choice; you cannot fire the revolver without the extension. When you take a firing grip the piece extends on its own. The grips were tried on a Smith and Wesson Model 442 five-shot .38. I fired the powerful Federal 129-grain Hydra-Shok +P during the evaluation. The results were excellent. I also fitted the grips to a Smith and Wesson Model 649 .357 Magnum and fired a cylinder full of Federal .38 Hydra-Shok. Then, to mix it up a bit, I worked over a favored load I sometimes deploy for protection against animals, the Federal .357 Magnum 180-grain JHP. A 180-grain bullet at 1,000 fps from the 649’s 2.25-inch barrel is very impressive. This is an overlooked option and a hard kicker. The Guardian grips made a big difference. I think that they have earned a place on the J frame. I will be deploying them on my personal .357 Magnum J frame revolver in the future. What do you think of a retractable finger extension? What is your favorite revolver grip? Share your answers in the comment section.